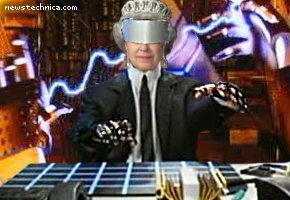 Her Majesty Johnny Mnemonic on the Jobcentre E-meter. Still from the movie Johnny Mnemonic and an official photograph of Queen Elizabeth II. The poster asserts that the use of this movie still and the official portrait is fair use under US law for purposes of political and satirical commentary.